Last week, I was in California visiting my in-laws. My sister-in-law got married, so we made the trek down there in the minivan. The picture quality isn't that great, and it's inside a drinking glass. Apparently, that's a sun spider. Also known as a wind scorpion. Apparently, it's neither a spider nor a scorpion... but twice as creepy as either of them. They're apparently non-venomous, but those jaws are just unacceptable. Creepy creepy creepy. Seriously. This thing freaked me out. I thought about bringing it home with me, but I had already caught a lizard... so my wife made me choose between the lizard and the spider/scorpion thing. I asked my daughter which one she wanted, and she chose the lizard, so that's what we have now. Haha this actually helped me I caught one of these tonight walking across my living room. Little suckers are FAST and they get really irritated when you mess with them but no biggie, it's a normal happening during summer nights. killed one in the livingroom in odessa tx this weekend. kids are keeping the remains in their bug collection. day aw vewy scawey!! i was sitting down on the sidewalk smoking a cigarette when one of them caught my eye.ive never seen them before and didnt even think it was a spider until i brought it in and took a closer look. its pretty trippy so i kept it. Yes, indeed. I have caught many of these. They are non aggressive and tend to haul across the ground, hence the name "Wind Spider". They are oftenly mistaken as vinegaroons. However, they are not related to them. Infact, it is common for many spiders to be named after, or mistaken as a scorpion such as the vinegaroon a.k.a. whip scorpion. On my travels, in tanzania, i found it scurrying around ind the front yard, and i ggot very fascinated, for i had never seen this kind before... sure it is not venomous? They're not venomous. But they are MEAN like no animal that size I've ever seen. I've seen them charge at people before. I swear, if these things could fly, mankind would live underground. I caught one in my daughters room scaried the hell out of me. Where did you find yours what city in california in in Tujunga. I found one in my home in Las Vegas. It wasn't moving and I thought it was dead. I put it in rocks glass and after a couple days, it started moving slowly. I bought it some crickets and it moved like lightening, biting the head off the cricket in a second flat! This is the best FREE pet I've ever had. I named him Recon cause he's a fast, silent killer. When they actually get into the house and I have to confront them - they will actually raise those front pads and challenge me....pretty impressive. and not nearly as intimidating. Great photo of the jaws- I don't miss them at all! I read that they don't chase people to attack most of the time they are just trying to get on peoples shadows. I live in Needles, CA and we had one of these in our work bathroom today. My coworker has seen them in her house many times, but somehow this was my first encounter with one. Creepy! We found one at our Fire Station in Magalia, CA. We made its jar the octagon of insect fighting. The Sun Spider took out 2 black widows, a meat be, a daddy long legs, gut finally met its match against a praying mantis. Demented? No, I don't think so, just watching nature at its finest. actually this spider is the result of someone in the military bringing one back from way back during desert storm. They are descended from the camel spider that we in the military see all over Iraq. The person who brought one back as a pet cross bread it with a tarantula and the end result was the Sun Spider. Granted they wont grow as big as the ones from Iraq but this is why customs now checks bagage so people dont dothings like this anymore. You're incorrect. The sun spider isn't a cross-breed of anything; it's its own species, from an entirely different arachnid order: solifugae. No cross-breeding going on. Saw one of thee at my Job. Didnt know what the hell it was either. In fact, didnt even think they were even from around here. Might of hitched a ride on one of the trucks (Deliveries) that came by. Our house (rental) is infested with these things! My husband was killing one a night, until a few days ago when we killed THREE in one night--all fast and furious as he**. The last straw was the third one, which we found in our bed. We've been staying elsewhere until we get an exterminator. Anyone know how to get rid of an infestation of these? basically after the 4th of july every year they swarm my house for close to a month, then tehy are gone, but i would like to know how to keep them out of my house? my house definitely isnt sealed, its old and hard to get all those cracks filled, but is there any chemical, sevin maybe? that might deter them from entering my home? i know they are mostly harmless but my irrational fear of spiders kind of ruins any connection i might have to them. i just want them gone, helpful or not, i cant sleep with these things around. and my anxiety level is through the roof. any info would help, i just want them gone. thank you very much. I'm visiting my sister in law in Vegas and she has killed 4 this week, then tonight we found an inch and a half long scorpion in the sink, I'll be checking the bedding closely, and my shoes in the morning! jordanjerome... is it actually possible that you are that stupid? what a freakin idiot. I had caught a sun spider recently, and fed it a common house spider. Watching those jaws in action really creeps you out. 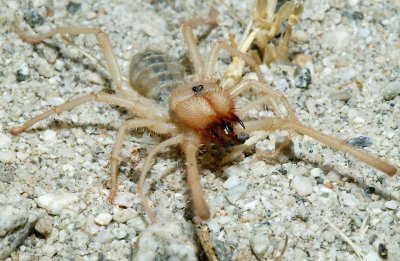 The sun spider is a smaller relative of the Camel spider from Iraq. I heard from a doctor that these spiders are not only harmless, they are beneficial to our environment as the eat other spiders (whom are harmful) and other pesky bugs as well. If you find one of these freaky friends..don't kill it...embrace it! Read a book called 'Nids by Ray Garton, it involves a sun spider, a 5ft long one. Sunspiders, camel spiders, shadow chasers, salifugids (sp?) Have really gained popularity due to their size (tho never heard of one 5ft?!) and frequency over seas. While i was there we had one as a mascot in our bomb dump. But i have even caught two smaller ones in my apartment in Great Falls, Montana. Very agressive but non-venomous and good to have as they commonly feed on spiders and scorpions... just dont get on the receiving end of those huge jaws, ouch! Cool specimens but not known to survive long in captivity. Very fast and fun to watch. Strong predators for sure. Ky windscorpions are really fast and yes they do bite and it hurts! They are creepy and they eat smaller inscets and also if they come across another windscorpion they will try to eat each other. They are completely blind so hense the 10 legs. They do grow big. My father and I caught them all the time and put them together and it takes about 6 hrs for the whole fighting thing to finish... And in captivity they can live up to 3 months. SO there is nothing to really to be afraid of. They are all over in my house in Montana. I've always called these Vinegaroons. I see 'em all the time here in Arizona, and at first glance sometimes mistake them for scorpions. We see this in NM and one of their names is child of the earth. They are nasty looking. 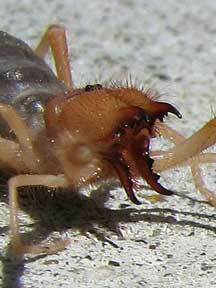 When my husband saw one he called it a camel spider and said they are all over Iraq. Now I am hearing sun spider for the first time! Funny how this one thing can have so many names! Some of these posts say they are harmless. I would disagree. Have been bitten by one in Colorado on my calf and let me tell you it hurt like crazy! @Joshua - the vinegaroon is a different beast altogether. 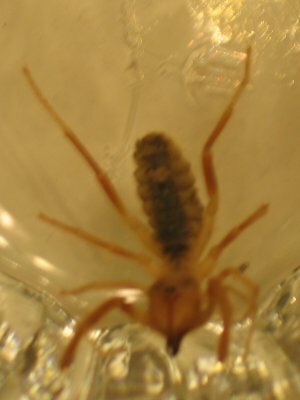 It's an arachnid like the solifugids (sun- camel- spiders) but has grasping pedipalps (claws) and a long telson (tail) through which they squirt concentrated acetic acid (vinegar), hence the name. found one in a basement bedroom in early July, in Montana. Ewww.